Princeton University researchers led by Coleen Murphy have identified a key protein in old, poor-quality C. elegans oocytes (unfertilized eggs): cathepsin B. 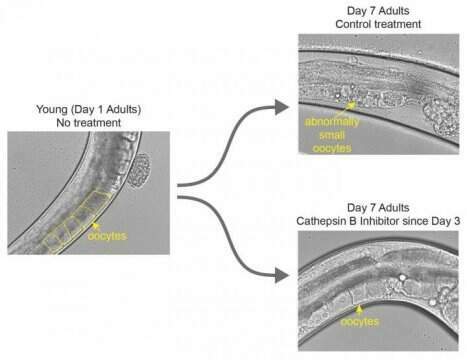 When they administered a cathepsin B inhibitor midway through the fertile window — on day 3 of the worms’ adulthood, the equivalent of a woman in her early 30s — they successfully extended egg viability beyond the normal span. Here, the image at the left shows a worm at the beginning of its reproductive window (day 1 of adulthood) with healthy, squarish unfertilized eggs. Worms who did not receive the treatment (upper right) have abnormally small, misshapen eggs by day 7 of adulthood. Worms who did receive the inhibitor (lower right) still have healthy, squarish eggs on day 7.
Credit: Courtesy of the researchers/Princeton University Women have been told for years that if they don’t have children before their mid-30s, they may not be able to. But a new study from Princeton University’s Coleen Murphy has identified a drug that extends egg viability in worms, even when taken midway through the fertile window, which could theoretically extend women’s fertility by three to six years. Her work appears in the current issue of the journal Current Biology. Murphy, who is also the director of the Paul F. Glenn Laboratories for Aging Research at Princeton, specializes in using a microscopic worm, Caenorhabditis elegans, to study longevity. These worms have many of the same genes as humans, including those that drive the aging processes of their three-week-long lives. Several years ago, researchers in her lab discovered that C. elegans not only exhibits a similar mid-life decline in reproduction, but also that their unfertilized eggs (oocytes) showed similar declines in quality with age to human eggs. As they investigated why, the researchers in her lab focused on the genes and proteins that are more common in healthy, young eggs than aging ones. They recently decided to try the opposite approach — investigate why some proteins are “downregulated,” or less common, in the lower-quality oocytes. Nicole Templeman and Rachel Kaletsky, postdoctoral research fellows in Murphy’s lab, investigated one downregulated group of proteins, cathepsin B proteases, that are rare in high-quality eggs and more common in eggs that have begun degrading with age. The existence of drugs that block these exact proteins provided an opportunity to test their effects. When Templeman administered the drug, she found that the answer was behind door number three: The treated worms still had healthy eggs long after the control group did not. They had administered the drug at the beginning of the worms’ reproductive window, the equivalent of puberty, so even though the drug worked, it wouldn’t be helpful to adult women, Murphy said. “What you want is a drug [that] you could give to a woman in her mid-30s, and it would still preserve the oocytes that she has,” Murphy said. So that’s what Templeman tried next. She waited until halfway through the worms’ reproductive period before she gave them the drug. It can be hard to believe that microscopic worms could have anything in common with mammals, let alone humans, Murphy admitted. That’s why she and Templeman were delighted to discover a cattle breeding study that found the cathepsin B proteins that affect the C. elegans oocytes play the same role in cows. The article, “Insulin signaling regulates oocyte quality maintenance with age via Cathepsin B activity” by Nicole Templeman, Shijing Luo, Rachel Kaletsky, Cheng Shi, Jasmine Ashraf, William Keyes and Coleen Murphy appears in the journal Current Biology on March 8, and was released online today. The study was supported by the Glenn Foundation for Medical Research, and National Institute of Health New Innovator (1DP2OD004402-01) and March of Dimes awards to Murphy. Templeman was supported by a Banting Postdoctoral Fellowship. Editorial note: Worm researchers distinguish between “oocytes,” unfertilized eggs, and “eggs,” which have been fertilized, but this article uses the terms interchangeably. For details about the experiments done with oocytes or fertilized eggs, please see the published research.